Los Arboles Addition is unusual, not only because it has original two-story Eichlers, but because it has them on flat land and near one-story homes. 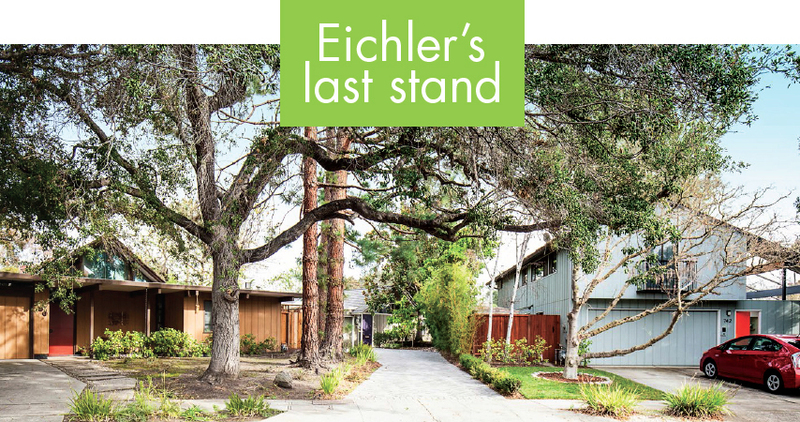 Here, Herb Fischgrund's original one-story Eichler (left) stands alongside Matt Johnson's original two-story (right). 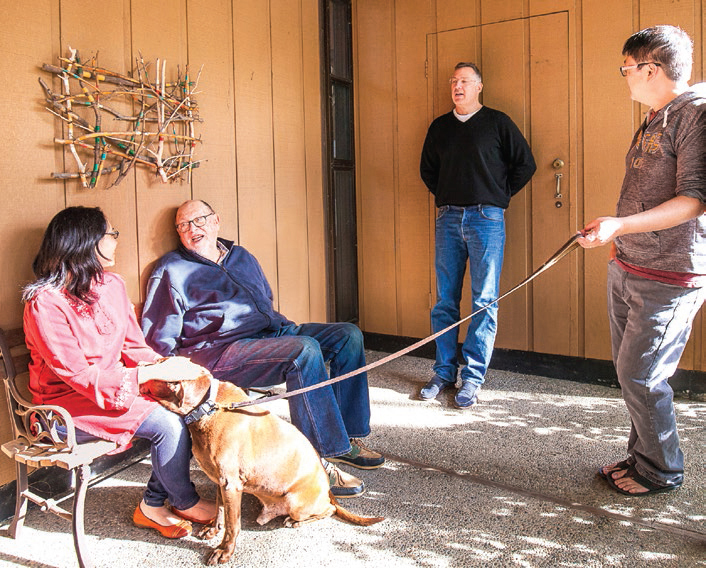 In between them, in the rear, is the single-story Eichler of Pradipta Ghosh and Peter Hu. One of the neighborhood's social spots is Fischgrund's bench, at the entrance to his Eichler. Seen here are (L-R) Ghosh, Fischgrund, Johnson, and Hu. 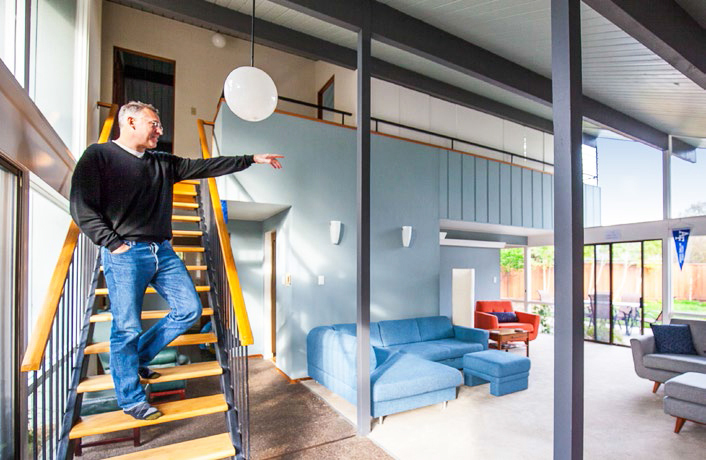 Matt Johnson, seen here on his Eichler staircase, has brought enthusiasm and new social activities to Los Arboles since he arrived in 2015. 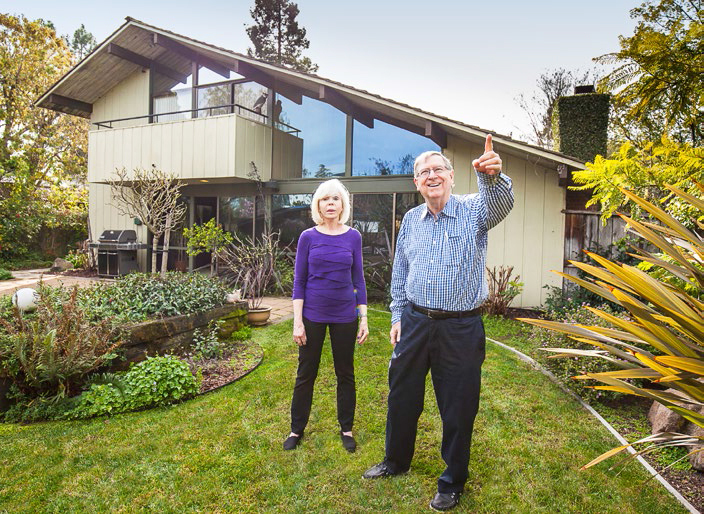 Original owners Chet and Jean Sandberg, pictured in their backyard (middle image above), surrounded by two other images of their beautiful two-story Eichler. From the start it's been one of Joe Eichler's more attractive little neighborhoods, large models with low or high gables alongside rare, original Eichler two-story homes. It's too bad Joe never got a chance to see it. The 30 homes of Palo Alto's Los Arboles Addition, as Eichler named the tract, were among the last he built, and most of the building took place after he died of a heart ailment in July 1974. Forty-five years later those homes—on Torreya Court and adjacent Loma Verde Avenue, plus one lone model on Middlefield Road—seem virtually intact, presenting an inviting streetscape shaded by live oaks, maples, and a mini-redwood forest. One owner, Chet Sandberg, has in his yard a torreya tree, the court's namesake. 'Los Arboles' means 'trees' in Spanish, but when the tract was new, there were precious few arboles to be found. "There was no landscaping at all. None at all," recalls original buyer Beverly Martin. It's called 'Addition,' or 'Los Arboles Addition 2,' because the homes sit next to the much larger Los Arboles tract from 1959-1961. More than intact homes and fine trees, though, what people love about life in the Addition are their neighbors. "Everybody pretty much does take care of each other," says Michael Montegut, a 16-year resident who has been raising two children here with his wife. "People visit when someone is sick. They help their neighbors who are elderly. It feels like a real neighborhood." "Once my kids were locked out of our house when I was late getting home. They knew they could go to any house in the neighborhood and they would be safe," he says. Herb Fischgrund, among the tract's first buyers, didn't move in until October 1974, several months after Joe's death. In fact, Herb says that in some ways these aren't Eichler homes at all, since the builder was the Klingbeil Company. Klingbeil was a builder that employed Ned Eichler, Joe's son, in California, from the late 1960s. Ned likely introduced the Ohio-based builder to his father. At some point in the early 1970s, Joe sold his firm of that era to Klingbeil, says Joe's grandson, David Eichler. Still, site and house plans are inscribed 'Joseph L. Eichler Associates, Inc.,' and in discussing the tract in a 2003 interview, the late architect Kinji Imada of Claude Oakland & Associates described Eichler as their client. Klingbeil finished the tract after Joe died. Los Arboles Addition was one of at least two tracts Joe was developing at the time of his death. The other was San Antonio Court, nine homes on Parsons Way and Almond Avenue in Los Altos. Eichler, working on all of these homes with architect Oakland, was also producing a few custom homes at the time, including one on Guinda Street in Palo Alto. Visiting the attractive tract, which is centered on Torreya Court, does not induce a somber mood. 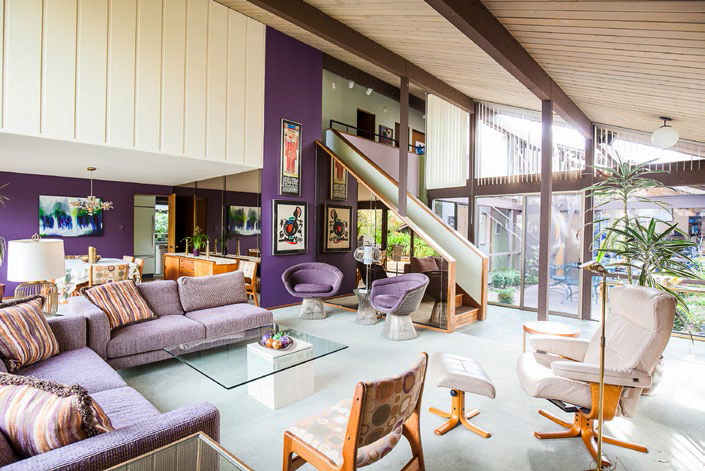 But it could if you think not just about Joe's death but about the fate of Eichler and other mid-century modern homes starting in the mid-1970s.